The 2003 Mustang is something of an enigma. On the one hand, there were no major styling changes overall, yet there were several additions in the nostalgia and horse power areas to merit some additional interest than a long in the tooth styling exercise should dictate. This was the first model year I'd actually been interested in driving a V6 convertible just to see if the hype in the magazines really lived up to the promise of a worthwhile base engine. I was surprised to find that, although the sound of the V6 and its 193 horsepower engine was uninspiring (fix that with a nice Borla exhaust or by retrofitting some take-off GT mufflers ) the performance was actually pretty good. I had to ahem... test full throttle several times to convince myself that yes, the tires were actually spinning and was very surprised to hear a chirp into second gear. Maybe you can get good mileage and still have some fun. 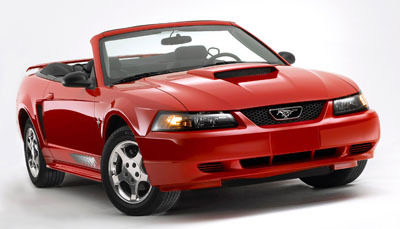 The 2003 Mustang also saw the return of the formidable Mach l a classic favorite, not seen in serious form since the 70's. Another high point of the 03 Mustang production, was the impressive SVT Cobra "Terminator", which is covered in detail in this link , plus I'll cover it here in more detail below (all good news). While the base car is virtually indistinguishable from its 2002 cousin, the 2003 Mustang Mach 1 is much easier. The original Mach l car which was first made available in 1969 was a fastback equipped street stomper with its now famous "shaker hood scoop" and cut out hood. It also had a very distinctive front lip spoiler and black rear spoiler, plus striping that made no bones about who and what it was. The new Mach 1 brought back those styling cues, with its own blackened front and rear spoilers, shaker hood scoop and distinctive stripes on the front of the hood and sides of the lower body. To complete the effect, seventeen inch throw back Magnum wheels were standard equipment As well,the car was lowered half an inch and has firmer suspension settings. Ford also brought back the SVT Cobra, but this was no mere styling exercise. The Special Vehicles Team had been hard at work, coming up with a worthy successor to the previous model. The new street terror, was dubbed by its engineers as the "terminator" and its supercharged engine and six speed manual transmission made no bones about its intent. Special badging for the 10the anniversary special Cobra was included on the rear deck lid. The anniversary cars also sported unique wheels, and restyled front and rear bumpers. 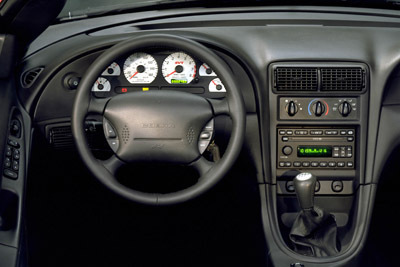 The 2003 Mustang SVT Cobra shares some most of the interior with other pony cars, however its distinctive 2 tone smoother looking seats help to set it apart from other cars. And so you didn't slip out of those seats at a high cornering rate, the inserts in the leather seats, were a non slippery and very custom looking suede. 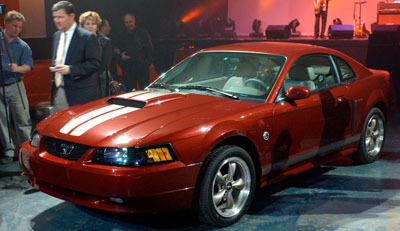 A special 10th anniversary Cobra package was offered on the Ford Mustang and featured special carbon fiber looking interior trim pieces and unique 2 tone red leather insert seats bearing the Cobra logo. 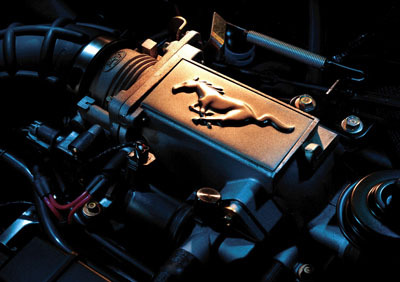 The base 3.8 liter V6 engine remained at an adequate 193 horse power, while the standard 4.6 liter modular V8 continued to provide 260 horse power. The Mach 1 package featured a 305 horsepower, DOHC (dual over head cam) 4.6 liter aluminum modular engine. Did I forget the Terminator ? Not hardly. This beast was a supercharged version of the 4.6 liter DOHC V8 and made a conservatively advertised 390 horsepower. Power was transmitted to a 6 speed transmission and a Cobra only independent rear suspension. 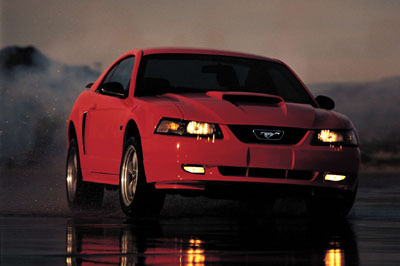 The 2003 Mach 1 signaled a return to the past in a good way. 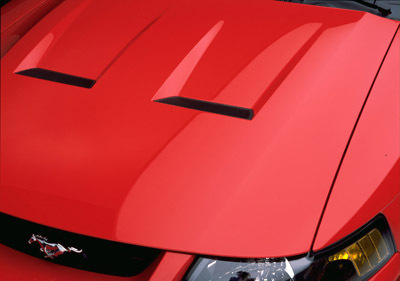 Classic styling and the return of the "shaker hood scoop" made this one memorable Ford Mustang. The Mach l interior featured distinctive small ribbed seat trim, that was very similar to the original 1969 Mach 1 high back buckets. Here's a link to the 2003 Mach l .